Japanese Catholic novelist Shusaku Endo’s novel Silence (Chinmoku) is a profound yet controversial work published in1966. Japanese film director Masahiro Shinoda made it into a film in 1971 under the title 沈黙 (Chinmoku)–SILENCE in Japan. Endo collaborated with Shinoda for the production. Now the film director Martin Scorsese released the film version of Endo’s novel to English-speaking audiences. When the book was originally published in Japan the Catholic Church of Japan ignored the work even though it was well received by general audiences. The L.A. Times film critic Glenn Whipp recently commented after the premier showing that “They [the audience] had just watched perhaps the most challenging film the celebrated director has ever made, a probing and deeply spiritual examination of faith tested by the seeming silence of God.” (December 5, 2016) When the film is released at the end of December, it will no doubt invite a variety of contrasting responses and controversies. Set in the era of Kakure Kirishitan (Hidden Christians) in the 1700s, Endo’s original novel along with his other work, such as A Life of Jesus (1959), Wonderful Fool (1973), and Deep River (1993), represent his own struggles with the Catholic faith that he inherited from his mother in the overwhelmingly non-Christian cultural and spiritual context of Japan. Scorsese has said that he wanted to make this particular picture for 26 years. 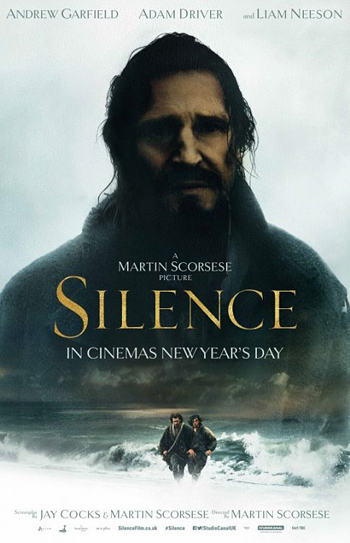 This suggests that the film is Scorsese’ own faith expression based on Endo’s Silence. This becomes obvious at the conclusion of the film. Endo’s novel ends with these words: “Even if he [God] had been silent, my life until this day would have spoken of him.” (286) The last scene of Scorsese’ film is a funeral for the apostatized Jesuit priest Sebastian Rodrigues. This scene is not in Endo’s novel. In Scorsese’ version Rodrigues’ wife who was imposed upon him by the shogunate government was allowed to view Rodrigues’ body for the last time. As she does so, her face was expressionless and without any trace of tears. The viewer is left to ponder what it means for Scorsese as he embellishes Endo’s novel. Religion writer Paul Elie says that Scorsese “instinctively finds religious patterns and images in modern, urban, vulgar, dispirited society.” (The New York Times Magazine, November 27, 2016). In a rather gruesome scene in which a Japanese convert to Christianity has his head decapitated without prior warning, the loudest cries of despair come from the Christian convert women who were forced to observe the scene. In the historically remote setting of ancient Japan, is Scorsese making his own confessional statement of his Catholic faith, that of being a selfless companion in others’ suffering? If so, he raises questions of faith for our own time as Endo did in his novel. In an age when Christian faith is often associated with propositional statements mixed with ideological tinges both Endo and Scorsese introduce an often-neglected dimension of faith–unresolved ambiguities and unconventional points of views. For example, the film begins with the sound of cicadas in summertime Japan with the screen left blank. In the follow-up conversation after the premier showing on the film in San Francisco, Scorsese talked about trees. When he visited Kyoto in 1989, his Japanese guide showed him trees after trees, he said. Why trees? It began to dawn on Scorsese that what sustains a believer in faith has much to do with something visual, audible, tactile, and natural (trees), and not necessarily abstract doctrinal teachings. Endo, too, talks about nature. In Silence Japanese culture and spirituality are captured in the word “swamp.” “If the root is cut, the sapling withers and leaves die,” says Rodrigues’ interrogator. (281-2) While the term “swamp” is interpreted by readers of the novel to be the decay of Christian faith in the foreign spiritual setting of Japan, it is also the symbol of Christian faith for Endo. “Swamp” strips away the institutional identity of Christian faith by the apostasy of the believers. And yet, it also reveals Christianity’s true substance, self-giving love. Scorsese, too, talks about this stripping away of institutional identity by saying that the Catholic faith does not totally reside in the church. This is a controversial statement given his deep formation in Italian-American Catholicism. Both Endo and Scorsese seem to be saying that outside the church and outside its ecclesial identity, faith lives on in the gutters of life. How does the message of Endo, captured in Scorsese’ film speak to viewers today?